The selection trials to determine the Youth Olympic sailor who will represent Bermuda at the inaugural Youth Olympic Games starts this Saturday. The trials will be sailed over 4 race days in the Great Sound over the next couple of weeks and has been organized by the Byte Class of Bermuda under the auspices of the Bermuda Sailing Association. A minimum of 9 races will determine the lucky sailor who will travel to Singapore in August with the rest of the Bermuda contingent. The regatta will be complete on Sunday, July 4th if no spare days are required. Owen Siese, Dimitri Stevens, Kalin Hillier, Alex Davis and Mackenzie Cooper. Judy Simons, President of the Bermuda Olympic Association will be following the progress with great interest and commented, “Over the years the Bermuda Sailing Association has always had strong representation in CAC , Pan Am & Olympics Games and the Bermuda Olympic Association is excited with BSA’s youth development program that their tradition of sailors will be seen in the inaugural Youth Olympic Games being held in Singapore this August, we wish them much success”. 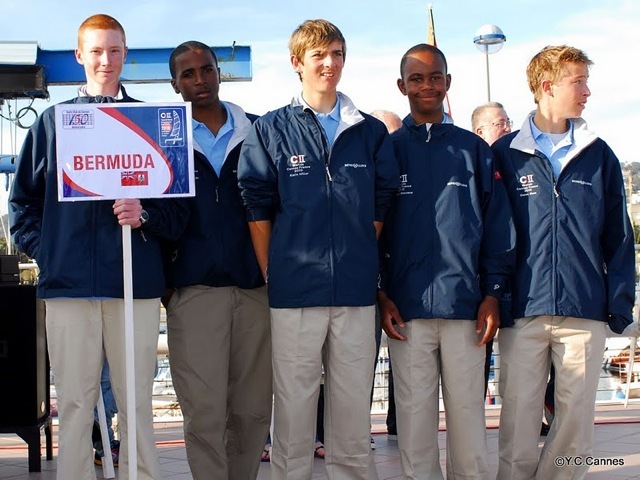 Pictured below are the Bermuda team at the Byte CII World Championships in Cannes, France in April 7.